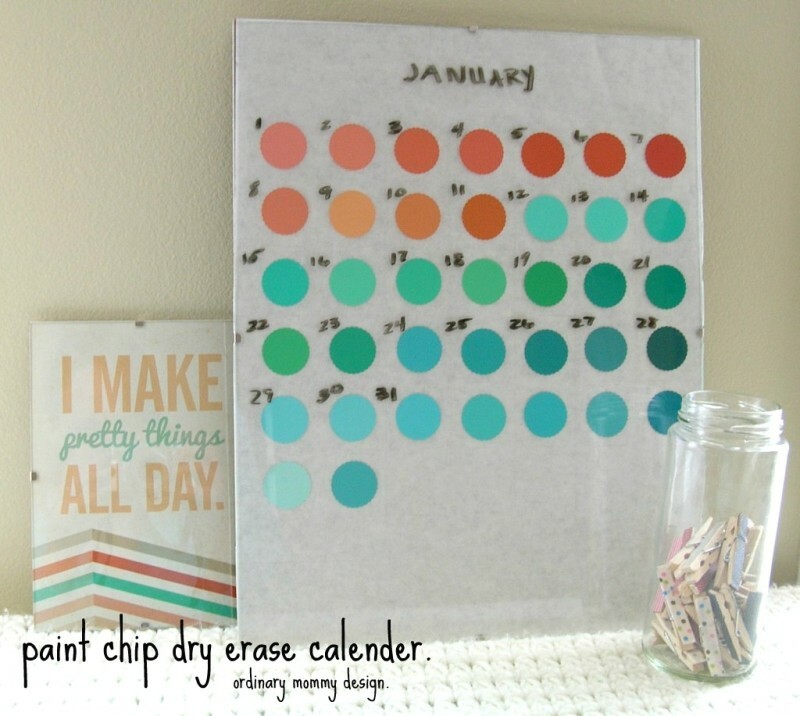 ORDINARY MOMMY DESIGN: DIY Paint Chip Dry Erase Calender Tutorial. 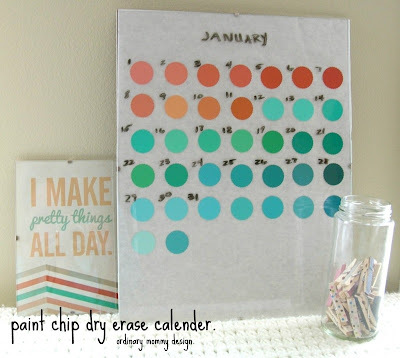 DIY Paint Chip Dry Erase Calender Tutorial. First off, I have to apologize for the quality of these photos. Trying to take photos of marker on glass wasn't easy for me! 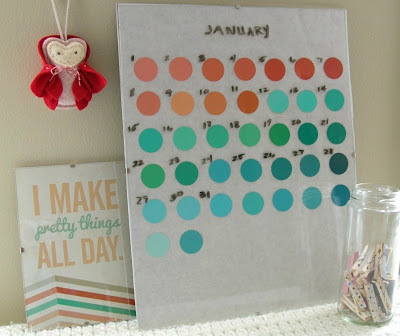 Anyway, I've been seeing DIY dry erase calenders all over and thought I'd like to try my hand at creating one with my own spin. 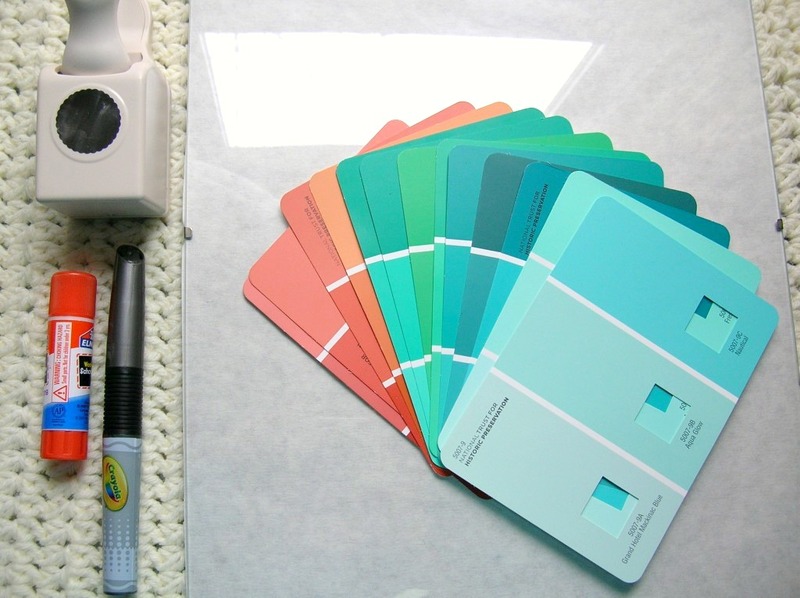 When choosing colors, try to pick paint chips in two or three different colors with a variety of values. 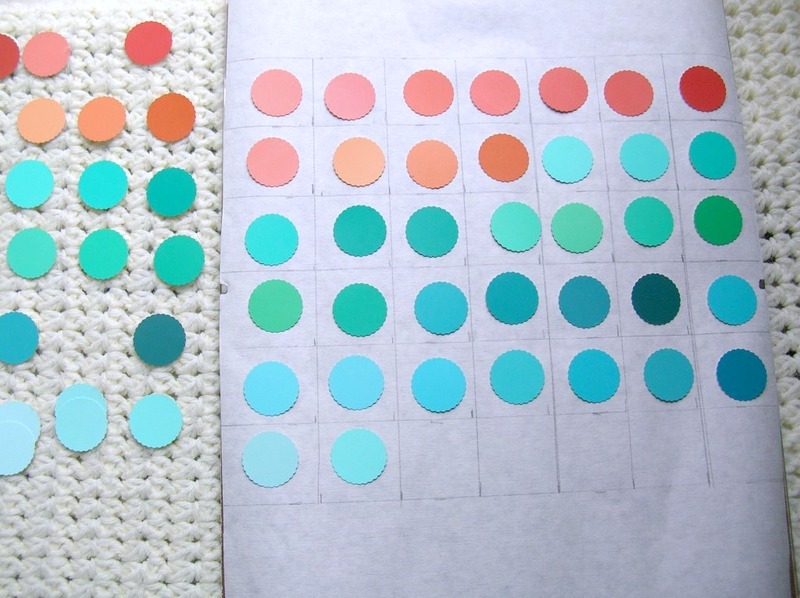 I chose corals and aquas with green and blue bases. 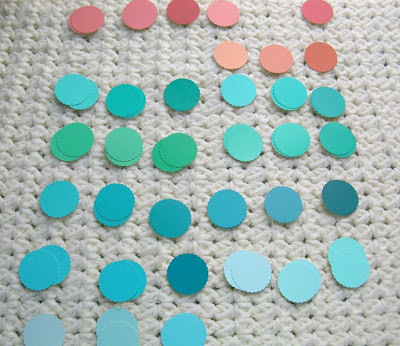 You will need 37 circles to complete the calender (in case the 1st of the month happens to fall on a Saturday). 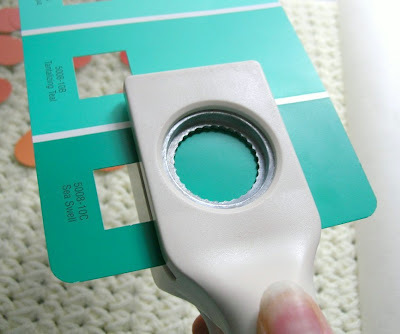 My paper punch is 1" in diameter; I used an 11 x 14 inch clip frame I had in the attic that was large enough to accommodate seven circles across and six down with room left at the bottom for writing notes. 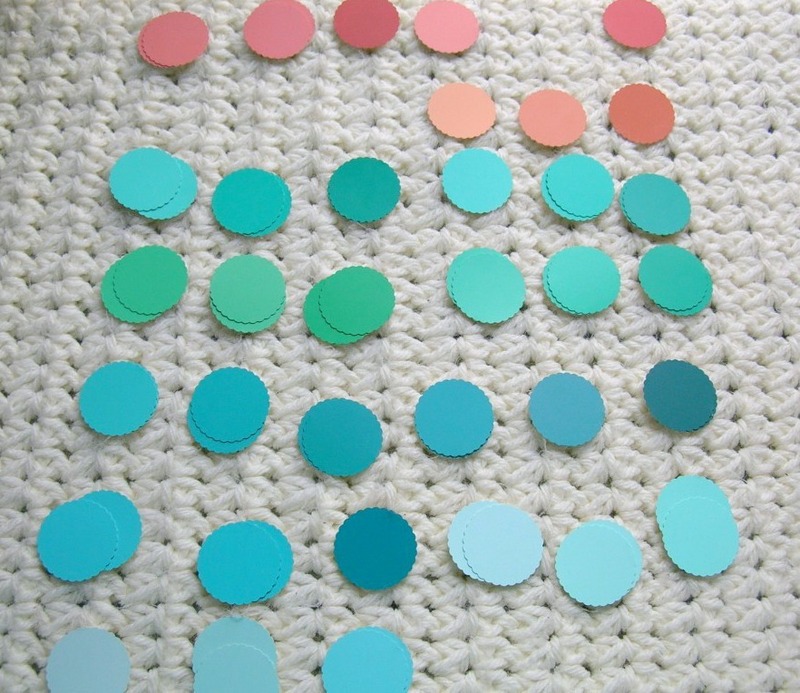 Begin by punching out circles from the paint chips using the paper punch. I always flip the punch upside down so that I can see exactly where I'm punching. 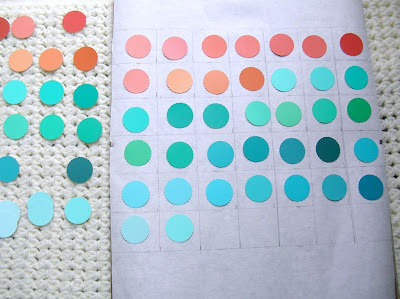 Once all the circles are punched, arrange them in such a way that you can see all the colors at a glance. 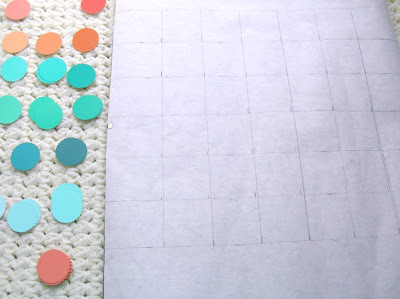 This will make it easier to put them in a pleasing order or pattern on the paper. Cut the white paper to fit the size of the frame (I have a roll of white paper that I keep for crafting purposes). All of that blaring whiteness frightened me a little, so I lightly drew a grid in pencil which really helped me to space the circles evenly. Play around with placement until you find one that suits you (the one above was not my final scheme). Arrange five rows of circles all the way across the seven days of the week, with the sixth row containing circles in the first two spaces only. Once the placement is set use the glue stick to adhere the paint chip circles to the paper. I found it better to put the glue on the background paper, as opposed to the paint chip itself. Don't forget to erase the pencil lines when done! If you want some modern minimalist art, feel free to simply display your new piece without anything written on it. Have fun playing with color and decorating your new dry erase calender! The sweet "I make pretty things all day" print pictured is from Yellow Heart Art. The little red riding hood owl is part of a set available in my shop. I love this idea Faith! 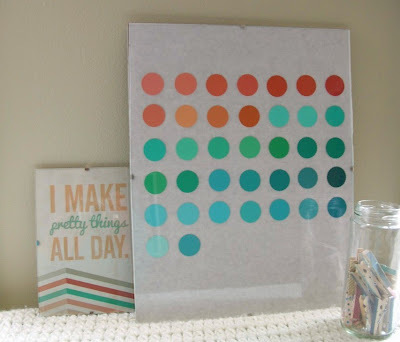 I made 3 dry erase boards a few years back and hung them next to each other. Jan Feb March then I had a view of upcoming things better. As the months progressed I took the old month down moved the other two to the left and re-hung the old one (now updated with a new month) on the far right. Your calendar is much cuter than mine were.